Get me to the church on time. Or is it city hall? Perhaps a sandy beach? 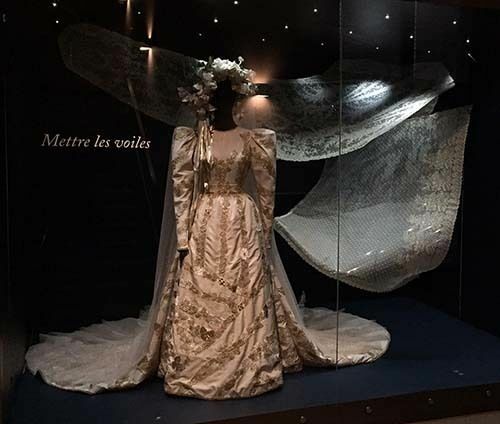 The institution of marriage has undergone its own evolution but its representation has been documented for posterity in a charming exhibition covering two centuries of bourgeois bridal fashions at the Costume and Lace Museum in Brussels. Ever stop to think why brides traditionally wear white, why they cover their heads with a veil, what constitutes a dowry, what makes up a trousseau, and what it all signifies? It’s not just “snowy” white. It’s cream, pearl grey, beige, in fact, 50 shades of white, as displayed in various museum glass cases. The symbolism behind it: white represents purity and innocence. The fashion of the Directoire and the Empire (1795-1820) advocated a return to antiquity and was largely inspired by Greco-Roman statuary with high-waisted draped dresses in white muslin. At the time, fashion magazines, which became increasingly numerous with a larger readership, featured white wedding dresses. Until then only the aristocratic elite had been able to afford them. Since the dogma of the Immaculate Conception was proclaimed in 1856, the color white also embodies virginity. As of this date, the rites of inclusion and passages in the Catholic faith all involved the color white, i.e. baptism, holy communion and marriage. The veil is another part of the nuptial rite, which, according to exhibition experts, dates back to the Romans. The man apparently placed he veil on his bride’s head, marking her passage from her father’s house to that of her husband. 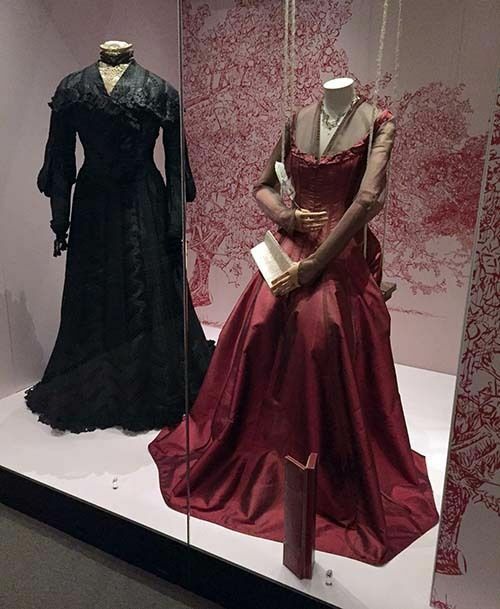 Before 19th century tradition dictated that wedding dresses had to be white, they came in various colors, including black, which some brides chose so they could repurpose their garments for use on Sundays and at parties in a bid for economy and efficiency. Interestingly, women on their second marriages or older brides turned to grey, beige, or violet. Today, it’s anything goes. That was on the surface, but what about underneath? 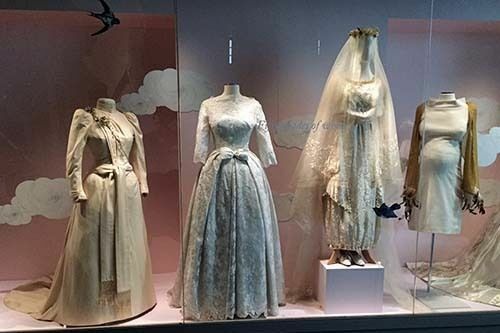 An elaborate selection of lace and other items made up the undergarments brides wore and continue to wear. One display groups late 18th century garters of silk taffeta embroidered with silk thread and quilted with wool, others with silk thread and chenille, a gold-plated metal buckle and metal springs enclosed in the elasticated part of the taffeta, 1925 stockings with Valenciennes lace running from the foot up to the knee with white embroidery, and a 1950s ivory-colored, machine-made lace corset to narrow a woman’s waist. In certain wedding ceremonies, the ritual of the auction of the garters symbolizes the rite of passage. The symbolic dispute between the two families about who will win the auction epitomizes the passage of the woman from one clan to another. The garter, which was part of the bride’s undergarments, also alludes to sexuality and fertility. Marriage was a financial affair, requiring a contract and exchange of goods that was fashionable until the 1950s. The contract back then mentioned the amount of the bride’s dowry and the value of the trousseau, depending on the family’s budget. For the liberal set, the concept may seem outrageous, but traditional and other societies follow the rule to this day. It was said “her dowry makes her even prettier,” notably for an unattractive woman. But what did it include that she alone owned and that the husband only managed as a custodian? 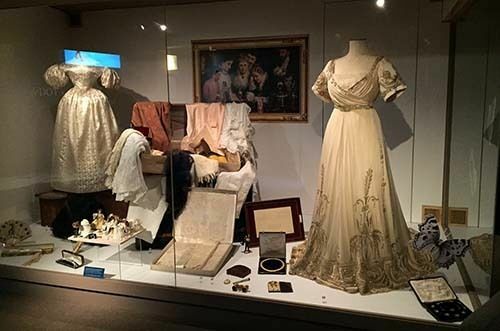 The trousseau consisted of household linen, especially sheets and tablecloths, undergarments and dresses for every day and was the only asset the woman could dispose of at will. Women of that period began preparing their trousseaus from adolescence. 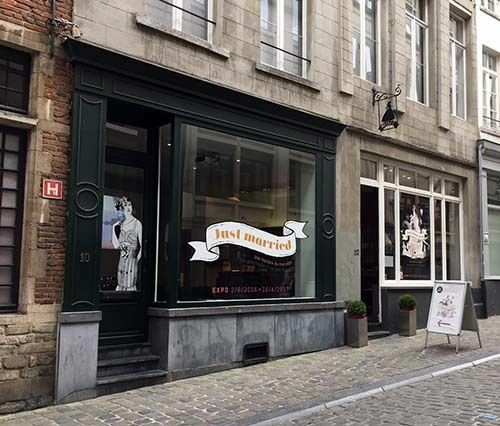 On the flip side, there was the “corbeille” (a basket) consisting of furniture, jewelry, furs, fans, opera glasses, handkerchiefs and other goodies the future husband would send his promised wife after signing the wedding contract. These items were destined to enhance the appearance of the future wife. The wedding corbeille, which already existed in the 18th century, is generally described in etiquette manuals as a large wicker basket lined with white satin. In the 20th century, this custom dwindled. Back then the “corbeille” amounted to 5% of the bride’s dowry but that tradition has been replaced by gifts from family members and friends. The wedding list is evidence of the change. It includes silverware, crockery, decorative items, appliances, and other needed items. Short of that, a bank account is listed into which loved ones transfer funds for the couple to choose how to spend the money. Needless to say, with women in the workforce, pre-nuptial agreements, cohabitation (sometimes with children), and various definitions of gender, the customs have had to evolve as well. But the wedding dress is still very much part of the marriage ritual and tradition-minded brides often give it as much attention as the ceremony itself.